"I am an artist and my name is Jay Jacob Livingston, a third generation silversmith. I've been the understudy of master silversmith Jake Livingston from such a young age, nine years old to be exact, all the while finding and incorporating my own techniques and designs. I currently reside in Sanders, Arizona. However my true roots arise from Pine Springs, Arizona which is located on the Navajo reservation. If I am not working on jewelry I am in Pine Springs tending the family ranch. I am Navajo and part Zuni. Both of my cultures influence my work, however as of late my motivation is derived from my beliefs in the Native American Church. I've also been trained in metal fabrication receiving certifications with high honors from Tulsa Welding School and San Juan Community College. This type of training has allowed me to create my own style of metal fabrication including heavy stamp work. My religious beliefs play an important role in my life and it's depicted in my work. I continue to blend my ideas with my techniques to innovate within my medium however one day I plan to expand my boundaries. I have won several ribbons for First Place titles in prestige art shows around the country including the Santa Fe Indian Market, Heard Museum Guild Indian Fair and Market, Southwest Indian Art Fair and the Navajo Nation Fair. Every form of art I create is truly one of a kind and is a part of me. I believe the Creator blessed me with this gift not only to show the beauty of my culture but share the blessing from the Creator to all his children. I sincerely appreciate your interest and look forward to sharing more with you! I'm currently at work on a variety of pieces which will be revealed at the upcoming Santa Fe Indian Market." 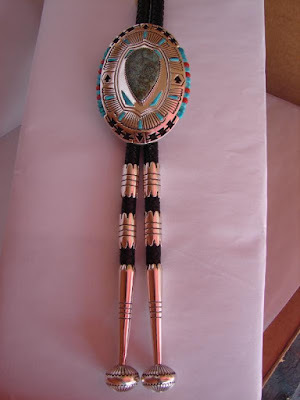 "As an honored featured artist I designed a piece titled, Burst Arrowhead Bolo. I contemplated so many ideas however my mind kept returning to a bolo tie I had made years ago. I always wanted to elaborate on that particular piece. At that time I knew I could make that particular piece better but almost every artist believes that about their art. Now that the opportunity presented itself and as I had mentioned in my mind's eye the returning image, I chose to make another bolo tie. Every one of my pieces are unique, never the same. 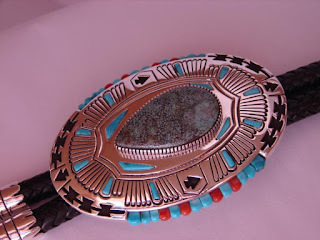 This bolo has a Nevada Blue Spider Web turquoise shaped like an arrowhead in the center with a burst feather fan affect. It is bordered with a rug design layout including four arrowheads depicting the four sacred directions. 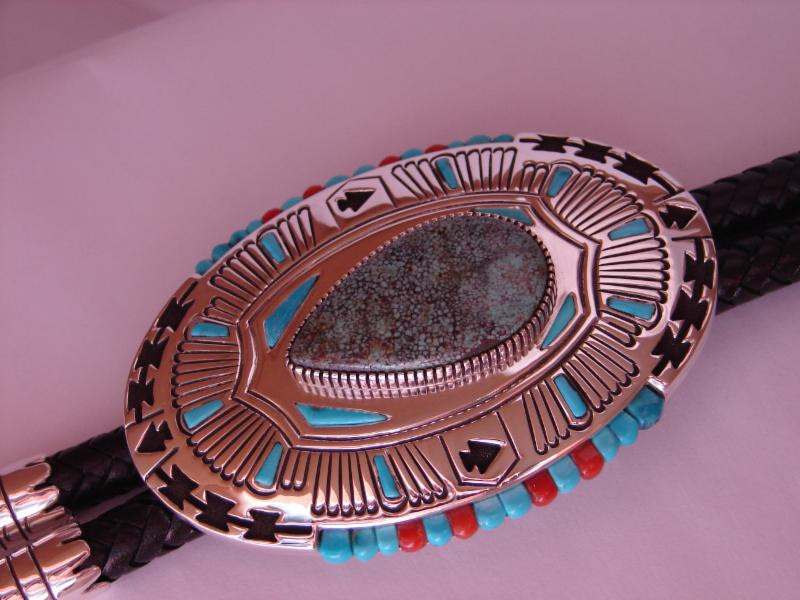 This turquoise bolo represents a form of protection thus the arrowhead design. It is entirely handmade from sheets of sterling silver, inlaid with precious stones such as turquoise and coral even down to the hand braided leather strap. I enjoyed making this bolo tie, especially now that I've incorporated other techniques. The fine inlay of small stones demands patience which is challenging however very rewarding. I am pleased with the outcome. As an artist we can work on a piece for a short time or have the idea of it in our minds for years before we even begin to work on it. Thank you for allowing me this opportunity to make my art come to life!" Meet Jay Livingston and see his Burst Arrowhead Bolo tie at the 2015 Pueblo Grande Museum Auxiliary Indian Market on December 12 and 13, from 9 a.m. to 4 p.m. each day at Pueblo Grande Museum. Visit the Official Indian Market website for more information on the event, artists, entertainment and more!